(BOSTON) — The Wyss Institute for Biologically Inspired Engineering at Harvard University has entered into a collaboration with ReWalk Robotics Ltd., to accelerate the development of the Institute’s lightweight, wearable soft exosuit technologies for assisting people with lower limb disabilities. The agreement with ReWalk will help speed the design of assistive exosuits that could help patients suffering from stroke and multiple sclerosis (MS) to regain mobility. The soft exosuit – which is a soft wearable robot that is the first of its kind – was developed at the Wyss Institute by Walsh and his team through extensive prototyping that included the involvement of roboticists, mechanical and biomechanical engineers, apparel designers, and software engineers. Walsh’s collaborators also include Terry Ellis and Ken Holt, both faculty members at Boston University’s Department of Physical Therapy & Athletic Training. “What makes the soft exosuit’s development so unique is the extreme multi-disciplinary nature of the work. In addition to our varied technical expertise as a team, our research with voluntary study participants has been central to our understanding of how we need to design and build these exosuits”, said Kathleen O’Donnell, who has been leading the team at the Wyss Institute with Walsh. Over the course of its development, the soft exosuit has been the catalyst for entirely new forms of functional textiles, flexible power systems and control strategies that integrate the suit and its wearer in ways that mimic the natural biomechanics of the human musculoskeletal system. Using form-fitting, fabric-based designs that are lightweight and non-restrictive, the Wyss Institute’s soft exosuit uses compact, powerful actuators packaged in a belt to provide assistance to the wearer’s legs in a physiologically relevant manner. These enhanced movements have the potential to assist wearers in walking with greater stability and metabolic efficiency, which could prevent injury and reduce fatigue. Most currently-marketed exoskeletons are rigid systems providing structural support and large assistance to patients with extremely severe movement disabilities, for example due to spinal cord injuries. For many stroke, MS, and elderly patients who can move partially on their own, the assistive and elegant movements of the lighter weight, flexible, soft exosuit could be used to overcome mobility limitations in their lower extremities. Currently in the United States, there are an estimated 3 million stroke patients and 400,000 MS patients who are suffering from limited mobility due to lower limb disabilities. “The soft exosuit is a wonderful example of how understanding how living systems work – in this case the movement and control of the human body – can inspire design of an innovative wearable robotic technology that has the potential to change the future of medicine. It is also tremendously gratifying to see how this collaboration between Rewalk Robotics and Conor Walsh’s lab has developed and been nurtured at the Wyss Institute, given our focus on translating technologies from the laboratory and into the marketplace,Ó said Wyss Institute Founding Director Donald Ingber, M.D., Ph.D., who is the Judah Folkman Professor of Vascular Biology at Harvard Medical School and the Vascular Biology Program at Boston Children’s Hospital, and also Professor of Bioengineering at the Harvard John A. Paulson School of Engineering and Applied Sciences. Harvard’s Office of Technology Development worked with the Wyss Institute to structure this collaboration with ReWalk, which includes a license for intellectual property and funding for the continued development at the Institute, towards bringing this new wearable therapeutic device into the marketplace. 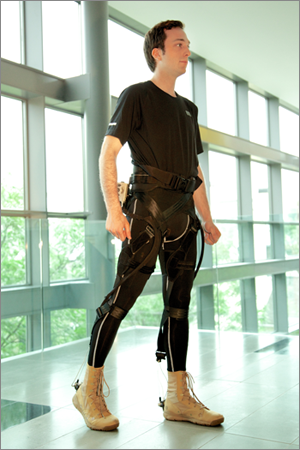 Additional funding for the Wyss Institute’s exosuit came from the National Science Foundation, the Harvard University Star Family Challenge, and the Defense Advanced Research Projects Agency’s Warrior Web program, which seeks to develop technologies to mitigate musculoskeletal injuries among military Service members while improving performance. Harvard University’s Office of Technology Development (http://otd.harvard.edu) promotes the public good by fostering innovation and translating new inventions made at Harvard University into useful products that are available and beneficial to society. Our integrated approach to technology development comprises sponsored research and corporate alliances, intellectual property management, and technology commercialization through venture creation and licensing. Harvard OTD also manages the Blavatnik Biomedical Accelerator and the Physical Sciences & Engineering Accelerator. ReWalk Robotics Ltd. (http://rewalk.com) develops, manufactures and markets wearable robotic exoskeletons for individuals with spinal cord injury. Our mission is to fundamentally change the quality of life for individuals with lower limb disability through the creation and development of market leading robotic technologies. Founded in 2001, ReWalk has headquarters in the U.S., Israel and Germany.